There's a suspicious puddle on the university campus. "It hasn't rained for weeks," points out Heather, staring into the watery abyss. "Half the students are blokes," returns Bill insightfully. She works in the uni canteen and so knows about toxic liquids. Moments later, Heather gets sucked into the puddle. We see her face trapped below the surface, like a 21st-century Ophelia. All of which puts quite the crimp in Heather and Bill's budding romance. Meet Doctor Who's latest foe. A time-travelling, shape-shifting puddle, possibly made up from boy wee. That's your licence fee at work right there. Fortunately, the star of the new series of Doctor Who (BBC1, Saturday) isn't a puddle, but Pearl Mackie, who plays the doctor's new assistant. After all those years I'll never get back, in which first Matt Smith and then Peter Capaldi mooned over Jenna Coleman's Clara, the so-called "impossible girl", what a treat to meet a new assistant who is not elfin but a gobby minx with a nice line in "Do what now?" expressions. Happily, probably the least interesting things about Mackie's Bill Potts are that she is his first lesbian time-travelling companion and his third assistant of colour (Freema Agyeman and Noel Clarke preceded her). No, the most cherishable thing about the girl called Bill is that she pricks the Doctor's self-regard, which is about goddamned time. The Doctor may think he's Michael Caine to her Julie Walters in Educating Rita, but she has other ideas. "Why do you run like that?" she asks during a chase sequence. "Like what?" asks the Doctor. "Like a penguin with its arse on fire." "Ergonomics." Bill's eloquent eyebrows comment: Yeah right. Ergonomics. That's why. When he shows her inside his Tardis, the Doctor asks if she has any questions. "Is this a knock-through?" Bill asks. "It's like a really posh kitchen!" Then her voice modulates into sympathy mode: "What happened with the doors - did you run out of money?" It's nice to hear Steven Moffat's droll dialogue here, especially after the vexations of his and Mark Gatiss's last outing for Sherlock. I liked, too, getting chills when Heather slid waterily under a door and recomposed herself in the Doctor's study. She was as sinisterly unstoppable as the liquid metal T-1000 in Terminator 2, a kind of child-friendly mashup of the most malevolent moves of Japanese horror flicks The Ring and Dark Water. After 50 minutes of time-travelling, puddle-confounding hokum, though, my abiding sense was that, thanks to the infusion of a new assistant, the ailing franchise has got its mojo back. APA 6th ed. : Jeffries, Stuart (2017-04-17). The Doctor finally gets his mojo back - thanks to a gobby new assistant. 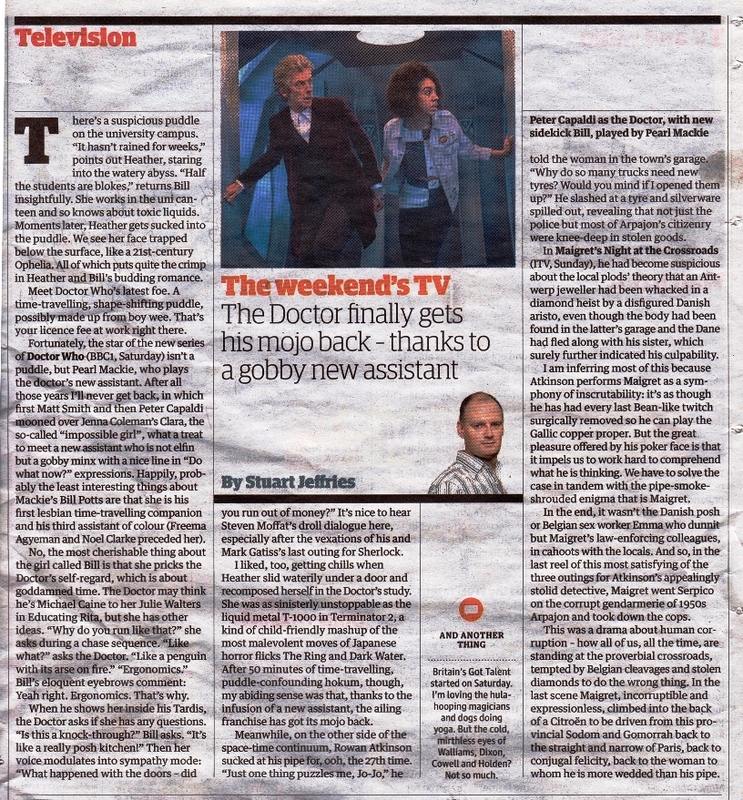 The Guardian p. G2. MLA 7th ed. : Jeffries, Stuart. "The Doctor finally gets his mojo back - thanks to a gobby new assistant." The Guardian [add city] 2017-04-17, G2. Print. Turabian: Jeffries, Stuart. "The Doctor finally gets his mojo back - thanks to a gobby new assistant." The Guardian, 2017-04-17, section, G2 edition. This page was last modified on 27 June 2018, at 00:15.